Gorgeous Silver plated spring opening bangle that is approx 65mm diameter with a 25mm x 18mm setting for your picture. Pictured bangle is an example - I will adjust any pictures sent, and can add names if you wish so please bear that in mind when sending me your pictures! I WILL EMAIL YOU A PROOF OF YOUR BANGLE BEFORE SENDING IT! 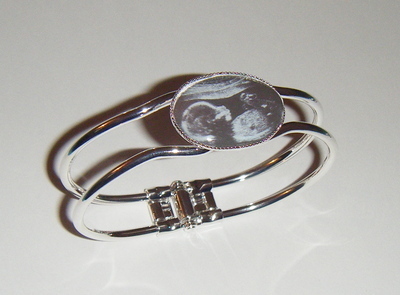 Ideal for keepsake gift for a new mum, grandmother or as a special keepsake if you are berieved.